La Borne is a hamlet on the outskirts of the towns of Henrichemont and Morogues in the Cher department of central France. Since the 13th century, pottery-making has been recorded in the area, however it was not until the 15th Century that potters were able to master the firing techniques suiting local clay, a stoneware clay fired at 1280°C. When fired at this temperature, the clay becomes watertight. La Borne’s golden age was during the 19th century. There were 21 workshops each one with a master potter, turners and labourers, who kept the “shop” (the term for the potters’ workshops) running. The use of the large-scale hill-climbing kilns was shared. Wares such as salting pots, terrine dishes, milk jugs and chimney pots were all sold throughout the centre and west of France. The traditional potteries went into decline in the middle of the 20th century, either due to competition from other materials or because the wares no longer were what people were looking for. Although at this time other pottery villages disappeared, La Borne underwent a rebirth. Ceramic artistes such as Jean and Jacqueline Lerat, André Rozay and Vassil Ivanoff came here to learn the secrets of clay from the old potters. Pierre Digan and Pénélope, Jean Linard and Christophe, Anne Kjaersgaard, Jean-Pierre Turpin, Barbara Delfosse. La Borne around 1965 (published in Elle Magazine). Pierre Digan et Pénélope, Jean Linard et Christophe, Anne Kjaersgaard, Jean-Pierre Turpin, Barbara Delfosse. La Borne vers 1965 (paru dans le Magazine Elle). Today, thanks to the tradition of pottery and the generations which have followed on from 1941 to the present time, the creative ceramic output of La Borne is of high importance in the contemporary landscape of French and international ceramics. There are around 100 ceramists working in La Borne and outlying areas, representing twelve different nationalities. For the last 50 years this international dimension has characterized the area. The Ceramics Association of La Borne has a membership today of 62 ceramists and sculptors, and their workshops and studios are dispersed between 15 surrounding municipalities. Pose de la première brique le 4 mai 2009 en présence des élus. In 1971, the Association of Potters of La Borne took over the former village school for girls to display their work as well as the work of invited artists. From 1992, the ceramists and local councillors wished to give the establishment a wider scope. 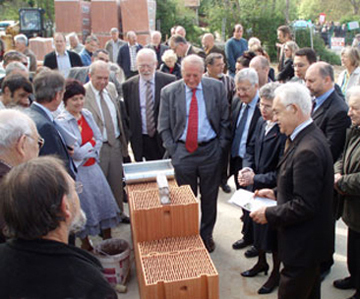 After much work and deliberation, a new public space opened its doors on 10 April 2010. The Communauté de communes des Hautes Terres en Haut Berry (the grouping of local councils in the highlands of the Upper Berry region) acted as the client for this investment project. The project has been financially supported by the French state, the Centre Regional Council and the Cher General Council. The Contemporary Ceramics Centre of La Borne now welcomes its visitors in the former village school for girls and in a long glass gallery (665 m2), designed by architect Achim Von Meier of the ‘Die Werft’ Agency.